Another busy session this week, mostly taken up with two consecutive meetings to review the proposed communications plan, and the hackspace initiative respectively. 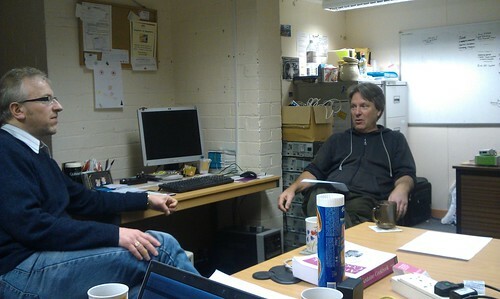 Anyhoo, suitably reinforced with generous amounts of coffee and chocolate biscuits, the meeting(s) commenced. 2. The LUG’s Twitter alias is @towerlug and Les will add the Twitter feed to the blog. 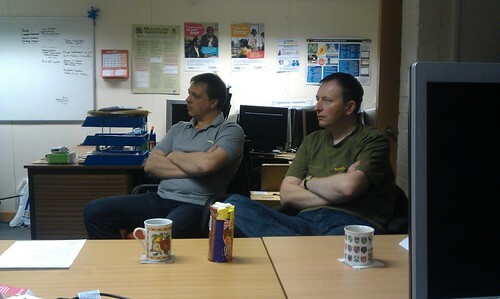 Twitter admins are Jon, Arran, Tony and Les. 3. The move of the website (and the ‘library’) to a Bytemark host was discussed, and the decision was not to proceed with this, due to the cost the LUG members would start to incur after 6 months. 5. To simplify other online services, Mike will move existing wiki content to the blog, and close Drupal site. 7. The Facebook page will be retained, and a @towerlug twitter feed added. 1. Simon already has elicited email from people who would be interested in using a hackerspace of some type. 2. We decided that it was probably too early yet to established a break-away group until such time as the level of interest has been proven by people turning up. 4. For the time being, these activities will continue under BLUG, and (subject to the previous point), people are welcome to do these as part of the normal 10-12 session until such time that it is deemed to worth extending the run time (and subject to availability of the venue). 5. Les will amend the top blog post to reflect the expanded set of activities. Meeting closed at 1pm (bit of a mammoth session – but then there were a few dinosaurs present) ;-). I expect to get back to a more normal session next week, but with the extra ‘hackerspace’ activities – lots of hands-on software and hardware stuff, interesting factoids, jolly banter (yes, I am looking at you Mr H!) and general helpfulness, plus the usual biccies and coffee! Looking forward to more jolly banter!